It just wouldn’t be OU enrolment if it went smoothly, would it? I went through enrolment last night. Not because I stayed up to enrol. Of course not. Who would even do that? I just happened to be awake because … Imma go with working on a TMA or something. Anyway, I didn’t get any kind of confirmation last night. Considering how “well” things went for me last year, I decided to ignore it and get some sleep. 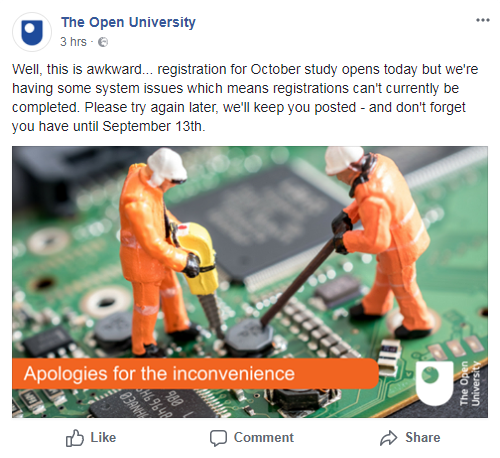 Sure enough, I found the above post from the OU’s Facebook account in the morning. After going through enrolment a second time, I got all the proper confirmations, and all my OU tools (the StudentHome page, my study record, my student loan page …) properly showed my new modules. So, what am I taking? You have to choose a route (and potentially a focus) for selecting modules at Stage 2 and above. Since I’m starting my Stage 2 study in October, I have to choose. and the two above, TM255 and TT284. The best of these is TM254. Project management is a skill set used constantly in IT, and most other office roles. So that’s what I’ll be doing this year, M250 and TM254, on the Broad route with a computer science focus. Next year I’ll be doing M269 and … Something else. I don’t really know yet, but I’m hoping my enthusiasm grows over the next year. Quick note on my current modules: I’m completely, totally, and in all other ways done with TM129. (EMA submissions went live today.) The questions on the EMA were more vague than I could hope, so I don’t really know if I’ll do as well as I did on TU100 last year, but I’m fairly confident of a distinction. I’m only studying MST124 now, and I’ve only got two units left: Taylor polynomials (which isn’t written very well, so I’m looking for external resources again) and complex numbers. I’m hoping to be done with both by the end of the Easter break, and I’ll have most of April and all of May for just revision for the exam. I don’t think I have much of a shot at a distinction there, but halfway through the module, I found that I really wanted to try for one. So we’ll see how revision goes.